We sell open end & ring spanner, Adjustable Spanners, Pipe Wrench, Spanner Sets.These are made from Chroam vanadium steel. In brand Akar, Taparia, Everest , Stanley, Jhalani etc. Solsons industrial wrench/spanner, Model SP1541, comes with the following features: replaces 31 wrenches and operates 62 sizes in SAE, metric and inch; automatically sizes any nut/bolt; self-adjusting rack and pinion design; slip-free grip – the harder it is turned, the tighter it grips. We are a known for providing high quality Adjustable Spanners. 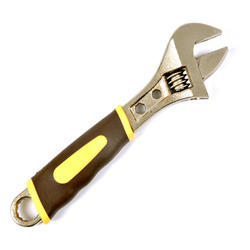 Adjustable Spanner at IMTC is a tool which can be used to loosen or tighten a nut or bolt. 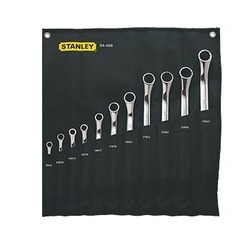 It has a "jaw" (the part into which the nut or bolt goes) which is of adjustable size, which allows for different size nuts and bolts to be handled by the same spanner. Compare this to the ordinary spanner which has a fixed size. Available Size: 18", 24", 30"
ø Jaw fully hardened & tempered.ø For holding on fastening nuts & bolts.